Oliver Hirschbiegel, director of Downfall, once again blends fact and fiction to great effect in one of the year's most overlooked films. Working on a smaller canvas here than on the Oscar nominated Hitler picture, German filmmaker Hirschbeigel tackles "The Troubles" in Northern Ireland with an intelligent and challenging screenplay from Guy Hibberts, who collaborated with Paul Greengrass on another film about the plight of Northern Ireland, 2004's Omagh, a worthy film that was also mostly ignored. Over black, the voice of Liam Neeson tells us, "In order to understand the man I am, you have to know something about the man I was," and so the part of the film that is fact is a meticulously recreated 1975 murder of a catholic boy by a young U.V.F. "soldier". The hit is lead by 17-year-old Alistair Little, who has volunteered with the hope that killing one of the enemy will make him a big man with the other lads, the higher-ups, who will then march him into the local pub as a hero, a force to be recognized. It's not personal for him. He doesn't see the enemy as a person. For Alistair there is only "us" and "them". As Alistair prepares to assassinate the Catholic boy, we are treated to scenes of the boy's family life and meet his little brother Joe, who spends all day kicking the football against the bricks of his row-house, trying to break his own record. When Alistair murders Joe's brother, shooting from the street into the bedroom window, he spares little Joe only because he mistakes the boy for a neighbour. The boy grows into James Nesbitt as the adult Joe Griffen, a husband and father teetering on the precipice of a nervous breakdown, and we wonder how much life was really spared, how much of the little boy actually survived. Joe is a man hollowed out over years of guilt and grief and, most of all, rage. Nesbitt plays him as a bundle of nerves that could kick off an explosion at any minute. 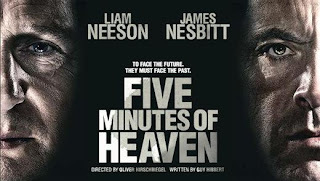 Liam Neeson plays the adult Alistair Little as a broken man, living a lonely empty life – a melancholy, lost soul haunted by the murder he carried out three decades ago, and about to face Joe Griffen for the first time since the night of the killing. A television reality program has brought them together ostensibly in pursuit of reconciliation. But with a dagger hidden in his belt, adult Joe has more than reconciliation on his mind. He's going for retribution and revenge for his "five minutes of heaven". This is the part of the film that is fiction, the imagined meeting of two men who "bare the legacy of" the true story. "Do I shake the man's hand or do I kill him?" That question drives the first half of the film, where the journey of each man toward the TV set is plagued with painful memories played out in flashbacks. The two leads are a great match, and one of the picture's strengths is the thrill of watching two actors at the peak of their talents play against each other, whether in the same scene or through the clever editing of their parallel stories and flashbacks. Both actors have given some of their best performances in films about the Troubles before: Neeson in the title role of Neil Jordan's excellent Michael Collins and Nesbitt in the lead of Paul Greengrass' pre-Bourne breakout Bloody Sunday. Here Nesbitt is electric. He careens wildly from composed family guy full of charm to raging would-be killer. It's an impressive tightrope that he walks. Equally good in his restrained, sorrowful performance as the repentant killer, Neeson's face, handsome in a slightly broken way, perfectly emulates melancholy and regret and gives Alistair Little a dignified grace that would not usually be afforded a character who has committed his crime. And while the film works as a revenge thriller building towards the two men's reunion, and we are reminded by Neeson that Nesbitt "...doesn't want to hear me say I'm sorry. He's here to confront me! ", it evolves beyond the limitations of the genre. Most revenge pictures work on the notion that we all want the hero to kill the bad guy. Look no further than Neeson's recent blockbuster Taken as an example of that, as well as Tarantino's comeback picture Inglourious Basterds, Mel Gibson's Payback (admittedly, good fun), Charlie Bronson's Death Wish, Michael Caine's Get Carter or most of Clint Eastwoods’ films. What sets this apart is that it takes its time setting up the murder, the events preceding it unfolding with the white-knuckle suspense of a great ‘70s thriller, so that we are emotionally invested in the fates of both Alistair and the little boy kicking the ball against the bricks. The film doesn't allow us the luxury of writing the young Alistair off as "the bad guy". We experience his fear, his resolve, his desire to prove himself to his peers and elders. We understand that he thinks what he is doing is right and true. And the killing is all the more horrific for it. When the smoke clears the ending is more complex and provocative than the revenge thriller aspects would lead you to expect. This is a film that never claims to offer easy answers, nor does it attempt to provide any. In the end we pray for mercy, for both of them, and wonder along with the filmmakers another question, a more difficult one: after so much violence and suffering, "is reconciliation even possible" for men like Joe and Alistair? This question drives the second half of the film with just as much tension as the first but with much deeper drama. We don't root for Joe Griffen's revenge; we wait with knots twisting in our guts for his reckoning. Further recommended viewing: Paul Greengrass' "Bloody Sunday", Pete Travis' "Omagh", Neil Jordan's "Danny Boy (Angel)" and "Michael Collins", Ken Loach's "Hidden Agenda", Carol Reed's "Odd Man Out", John Ford's "The Informer", Jim Sheridan's "In The Name Of The Father" and "The Boxer", Alan Clarke's "Elephant". The movie with a very catching title and a very toopical content. Especially for today's world.